Life raises countless questions but only gives few answers. These are sometimes surprisingly obvious, however. 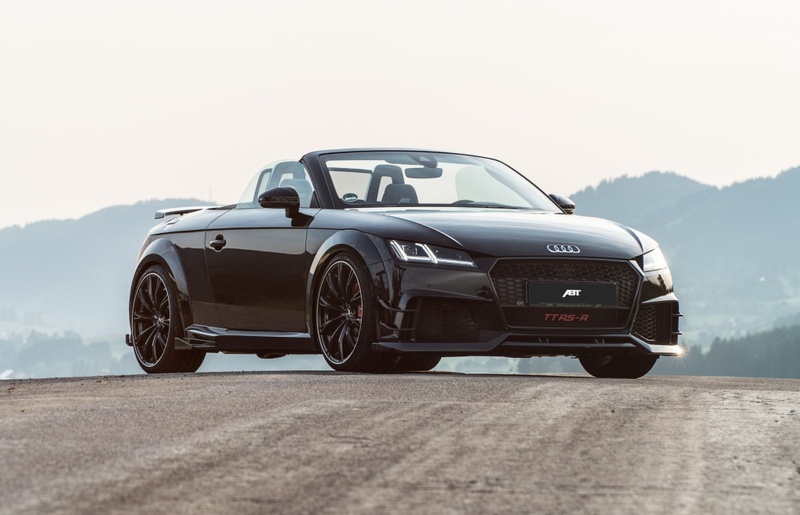 For example, the answer to the question of the perfect car for summer can only be ABT TT RS-R Roadster. After the fine-tuning by ABT Sportsline, the world’s most powerful series ex factory five cylinder achieves a formidable 500 HP (368 kW) at 570 Nm, guaranteeing even greater driving pleasure and performance. The convertible’s optimized motor management, combined with enhanced styling promises the Summer of your Life. ABT Power R titillates a formidable additional 100 HP from the Audi TT RS’s 2.5 petrol engine, allowing it to reach 100 km/h entire 0.5 seconds faster. “We always achieve the maximum in terms of performance of the engines,” managing director Hans-Jürgen Abt stresses. “But never more than technically reasonable. 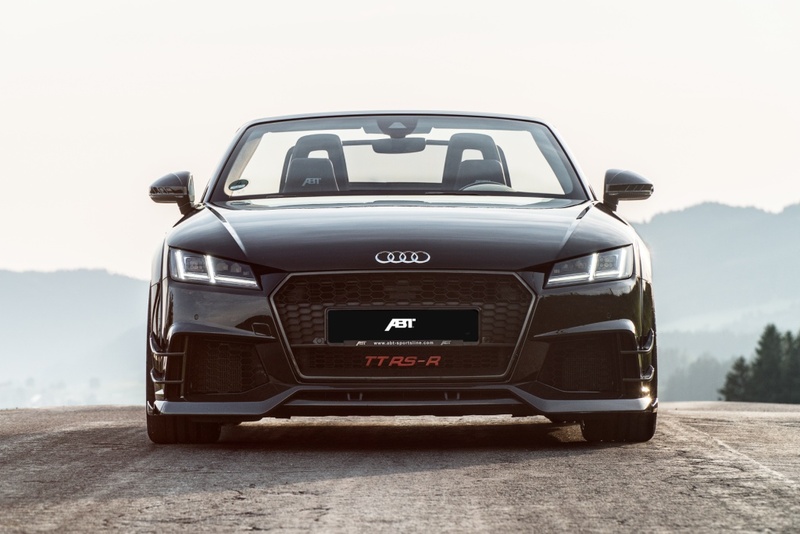 Therefore, there is no risk to the vehicle, and our customers don’t have to compromise to benefit from an ABT.” The ABT TT RS-R Roadster has been given the right stainless steel exhaust system with double tailpipe trims, so that the sound really does do justice to the additional power. Besides the technical improvements, numerous visual changes have been made out- and inside the vehicle. 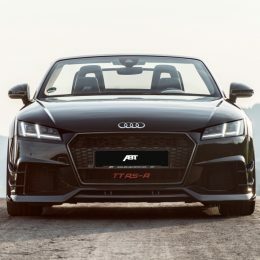 For example, add-ons made from carbon fibre enhance the exterior, giving the limited edition of 50 ABT TT RS-R a significantly more elegant and sportier look. Among other things a front spoiler, front flics and front blades have been added. The new, exclusive front grille frame with red TT RS-R lettering has also found its way into the model. Further details, such as the side skirt add-ons with side blades and the multi-part rear skirt, create consistent highlights. Finally, the 20-inch ABT SPORT GR wheels in “glossy black” with diamond machined flange are a clear indication that the ABT RR RS-R Roadster is no normal vehicle. Refined seats with TT RS-R logo and numerous badges are now waiting in the inside, which points equally to the Roadster’s exclusivity and origin. The ABT LED-door entrance lights have also found their way into the Audi and project the ABT TT RS-R logo onto the asphalt each time you open the door. 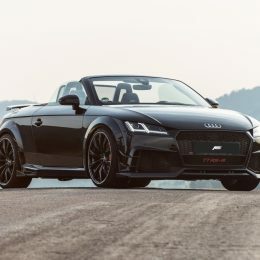 Should the ABT TT RS-R Roadster’s available equipment contrary to expectations fail to satisfy all demands, ABT Sportsline’s extensive range of optional add-ons is available. For example, the catalog includes a leather and carbon interior as well as different rims or sports stabilizers. The experts at ABT Individual are on hand, who offer tailored handcrafted solutions for models that are absolutely unique.